Philadelphia has over 20, 000 abandoned houses, and folks lost count of the vacant lots after about 30, 000. We’ve got 700 abandoned factories, with over 150, 000 lost jobs. Rather than see it as post-industrial wreckage doomed to decay, we like to think of it as a city that is poised for resurrection. Sometimes folks refer to our neighborhood here in Kensington (which has suffered the brunt of urban decay) as “the Badlands”… I’m always quick to remind them that language like that was also used for a town called Nazareth, where folks said “nothing good could come.” But we know what showed up in Nazareth. And every day we see God show up in Kensington. Over the past 15 years, Kensington has been our demonstration plot for love. It is on these broken streets that we have made a habit out of practicing and participating in resurrection — every day. We’ve done murals on ugly walls and turned trash-filled lots into gardens. And we’ve rehabbed nearly a dozen houses, some of which we’ve bought for as cheap as $1. Not bad. There is a difference between building a house and building a home. You can build a house in a few months, but it takes years to build a home. It’s hard to be a friend and a landlord. We always prefer to be friends so that can make us pretty bad landlords. It’s one thing to see someone get a house, and it’s another thing to see them keep it. For these reasons and tons of others, we’ve teamed up with Fuller Center for Housing and a bunch of great local organizations – convinced, as always that we can do more together than on our own. This past year The Simple Way met with Fuller Center for Housing, rooted in the legendary Koinonia community down in Georgia… and it felt like a match made in heaven. Our new organization, SIMPLE HOMES FULLER CENTER is the offspring from that romance. We will not become a massive housing organization but more of a collaborative group of friends fixing up homes here in Kensington, and supporting friends in other neighborhoods as they do the same thing. This week we had a meeting with folks representing over a dozen local groups who have been working on housing for decades, sort of our local housing experts – and it was a magical time of dreaming and scheming with organizers, accountants, CEOs, carpenters and architects. We met in a formerly abandoned house that we fixed up after the fire of 2007. We threw around visions for collaborating locally – everything from a tool-share where neighbors can sign out a drill for the day, to an emergency fund for homes that need help, to a guild of skilled workers with sliding-scale wages so they charge more to folks with more and less to folks with less – “Robin-hood” renovators. There’s a pretty exciting buzz around here. Turning vacant houses into viable homes is one critical part of our holistic, integral work of combating poverty and inequality – and SIMPLE HOMES will be the vehicle for all things housing around here. This past month we established SIMPLE HOMES as a new nonprofit, and it will be the housing arm of our work in Kensington. We’ll build on the past two decades of relationships and experience at the Simple Way, but we’ll also build on the past 40 years of expert wisdom from Millard Fuller and friends (who helped start both Habitat for Humanity and the Fuller Center for Housing)… and we’ll do it all in close collaboration with other friends in the area. I hope you will join us in this very exciting new project. In fact, it all started from friendships. After meeting folks at Fuller, I was talking with a friend of mine about our vision, and the fact that we could buy a house for around $10, 000 on our block. He got so excited that he wrote me a 10, 000 dollar check on the spot. Maybe you have 10, 000 to help us fix up the next house. And maybe you don’t. We don’t just want money, we want YOU– friends who believe every person should have a dignified place to live. And then we want to conspire together to make that dream a reality – whether that means writing a check or picking up a hammer. 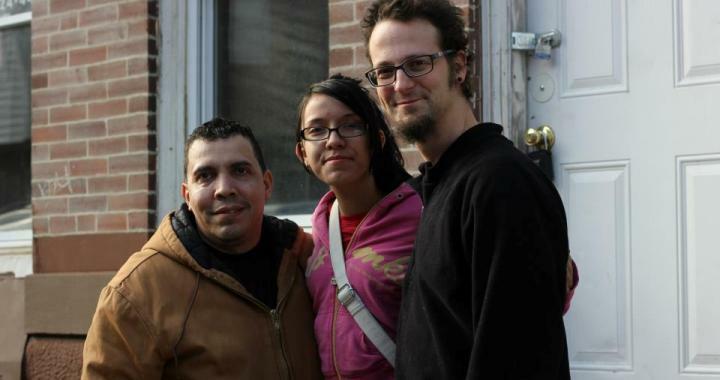 Last month, SIMPLE HOMES purchased our first abandoned house for about $15, 000. And this past week we celebrated the new owner, my long-time friend Miguel Diaz. He was one of the first folks to welcome us on Potter Street 15 years ago, and has been a dear friend every since. As Katie and I renovate our new house around the corner, we couldn’t be more thrilled to see Mike start to renovate a home for his family, across the street. At the end of the day, SIMPLE HOMES is about friendship. It is about building a village together. And it is about building a better world… one home at a time. May the prophecy be fulfilled — in our neighborhood, and in yours. Thanks for being a part of the web of subversive friends. Jesus’ Name is Alecia. Really?